"Being a parent I can relate. I know what it’s like now to not be able to work on projects that I want to work on. And those are like real life obstacles, whether it’s a day job, or a sick family member, or a young child that needs taken care of. There are a lot of obstacles in our life that keep us from being creative. Whether they’re just excuses we make up for ourselves or they are real. We still need to be creative. That’s the breakthrough that I made. It seemed harder to do my work as an artist and be a mom. It felt easier to maybe just stop being an artist. Even playing around with that I tired putting it down for a month or so seeing if that was easier, and it wasn’t. 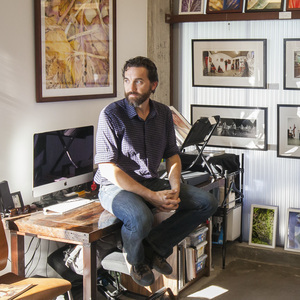 That was a real breakthrough to know where my creativity came from and why I needed to create. It made me more of myself and it made me a happier person and it was an expression that I needed to get out. That’s nice to know that it’s not for other weird egotistical reasons that people feel like maybe they are or might be creating for. It was nice to clear the air and understand that I wasn’t creating for anyone other than myself to become fully myself." 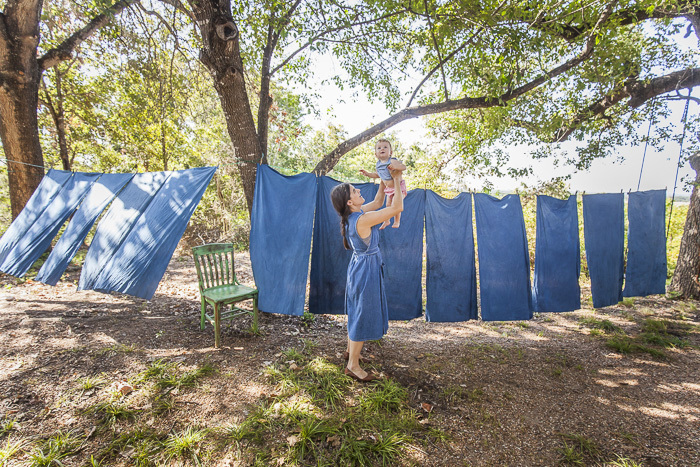 Maura Grace Ambrose is a natural dye artist and quilt maker who lives close to the land on ten acres just outside of Austin with her husband and four year old daughter. 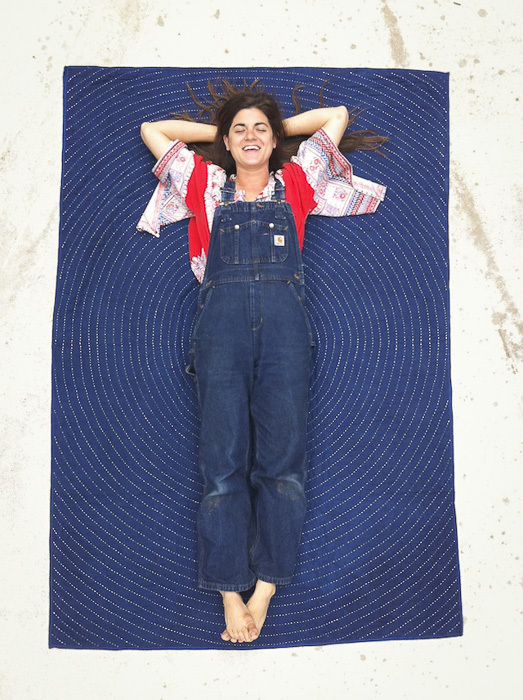 She studied fiber arts at The Savannah College of Art and Design and after some time working on an organic farm as the greenhouse manager took a fateful four month trip around the US with her husband. As they made their way back to Texas she decided to give it a go and put her skills to use by starting her own company. In addition to her love of the fiber arts Maura was encouraged by her experience growing plants from seed at the farm and felt compelled to create and tell the story from plant to dye to color to quilt in her own unique way. 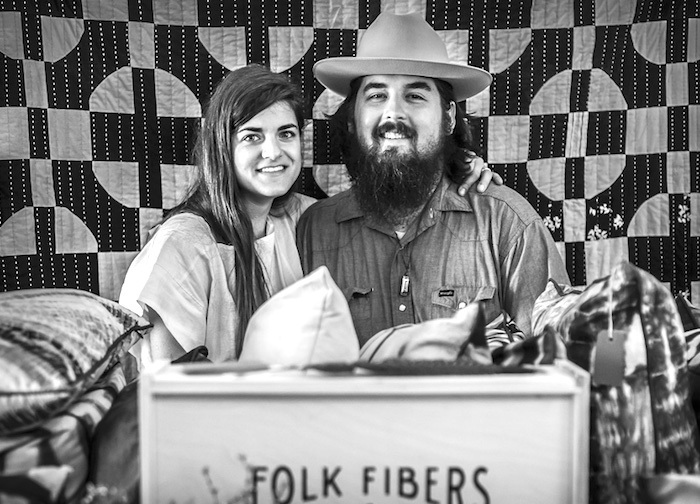 Folk Fibers was born. Relating more to a painter than quilter, she loves to capture in her work, seasonal colors, the palate and soothing patterns that are the story of nature and her surroundings. The resulting quilts are practical, functional, long lasting, but also a piece of art, the makers hand in every stitch and composition. She is also inspired by the materials, techniques, processes, and traditional styles of the past. 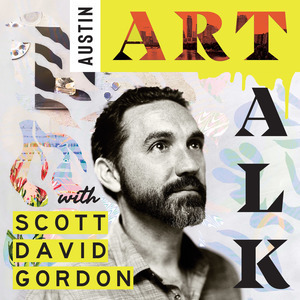 The interview delves into many aspects of being a parent and an artist. After much success early on in the life of her business she had her daughter Ada. She realized she couldn’t maintain the same pace of work and had to really look hard at why and how she wanted to create going forward and balance that with just wanting to be a mom. As Ada has gotten older there have been more opportunities to make space for projects and teaching and she relishes those windows of time where she can completely focus on her work. I’m very happy to share this conversation with my very good friend of eight years! I admit after watching her new Piecing A Scrap Quilt workshop, I want to make my own. 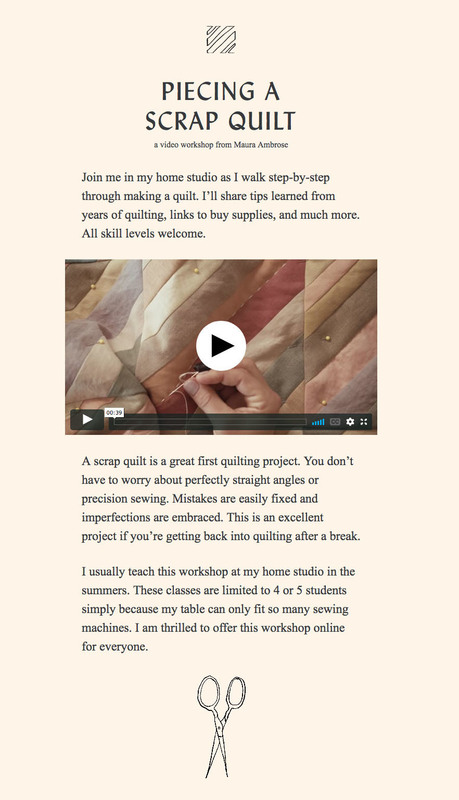 With the release of the first of many video workshops, she is able to teach those who what to learn quilting and go at their own pace, but who would not be able to attend her limited in person workshops in Texas. Maura is very thoughtful and has a lot of things that she shares with me in the interview that I am thrilled to share with you. Please enjoy and be sure to check out her website and workshop at Folkfibers.com. Click on the image below to check out Maura'a new workshop! Here are some photos of Maura I have taken over the years. 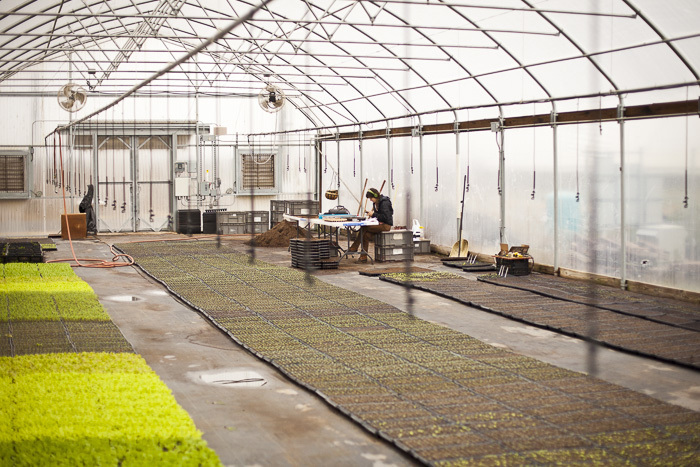 Maura seeding in the JBG greenhouse Jan. 2011. Maura and Chap at Feliz in 2012. Playing around during a quilt photo shoot in 2013. With Ada during an Indigo dyeing session in 2015. 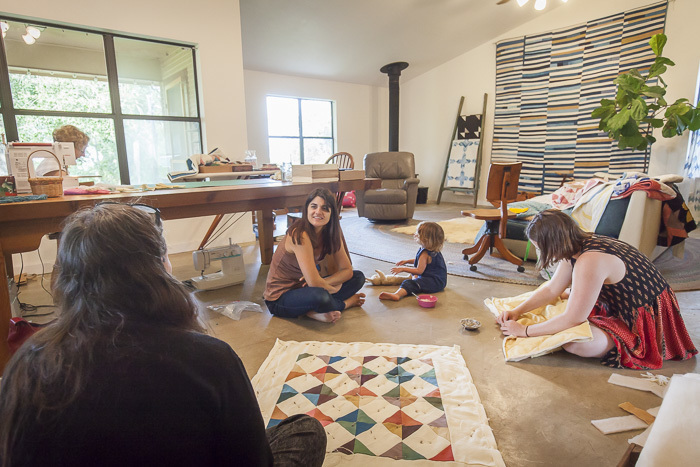 Teaching a quilting workshop at her home in 2016.